PRESS RELEASE: The 2009 Mansons Guitar Show announces a fantastic line up of exhibitors and artists. It takes place on the 24th & 25th October at the Riverside Leisure Centre, Exeter. Over 40 trade stands will have products on display ready for you to check out. 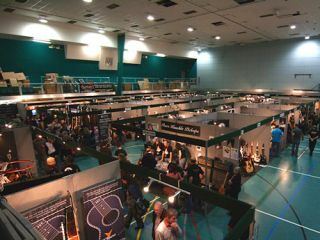 Exhibitors include Marshall, Peavey, PRS, Ernie Ball, Rotosound, Orange, Fender and Roland who will be rubbing shoulders with specialised companies such as Godin, Peerless, Trace Elliot and G&L. For the acoustic side of the show, brands confirmed include Martin, Faith, Taylor, Freshman, Huss & Dalton, Patrick James Eggle, Yairi and Tanglewood amongst others. There will be incredible show deals, a stunning array of equipment, new product launches and experts on hand to answers any questions. This is a must for and electric, acoustic or bass guitar enthusiasts. There will be amazing prizes on offer at the show - last year over £3,000 worth of equipment from Marshall, Orange and Peavey was up for grabs. The free MusicRadar newsletter serves up the week's biggest artist and product news stories alongside exclusive tuition and gear reviews.Sign up here! Get instant updates and bonus content plus chat with the team.Start here! For products registered prior to the 1st June 2009, the update to Melodyne essential 2 will cost 59 US$ or 49 €. For first registrations subsequent to the 1st June 2009, the update will be free.